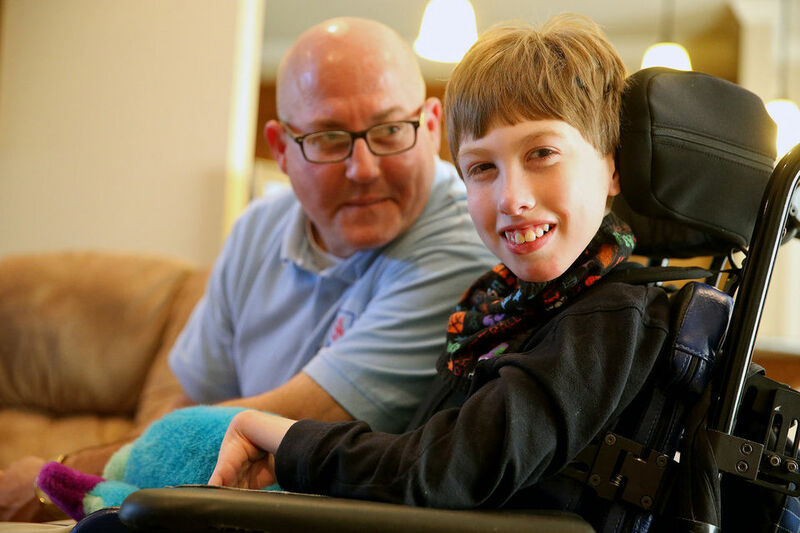 Connor James O'Brien is an amazing 14-year old boy with a remarkable joy for life, which he shares with others daily through his smiles and laughter. He appreciates humor and fun times with friends and family, and it is evident in the quality of relationships with those around him. Connor has cerebral palsy and communicates with an augmentative communication device (a touchscreen "computer" that speaks phrases and sentences created by him to express his thoughts and ideas). He enjoys using this device to play games and to joke with others. When doing his school work, he uses his "computer" or an iPad to answer questions as well as to read and learn new material; and like any child his age would do, he attempts to switch the screen to fun games or video clips. Connor has another different ability with regards to using a wheelchair for mobility. Connor doesn't want that difference to be a defining characteristic of who he as it is just another way to do the same things as his peers. Some of his favorite physical activities include Buddy Ball League baseball, tabletop football/soccer, and Nerf-style basketball tosses. Connor's favorite snack is white chocolate Reese's, and he is a tremendous fan of America's Got Talent episodes. When given the choice of his favorite activities, America's Got Talent and Reese's cups seem to rank the highest. He is an extraordinary boy with a big heart, as the books portray; and it is our hope that you see how the "real" CJ has inspired those who know him as we write these adventures.